This is Urdu version of “Sustainable Development Goal 5: Achieve Gender Equality and Empower All Women and Girls”. Political Parties are an essential component of any democratic system and the foundation of a strong Parliament. Tabeer-Consolidating Democracy in Pakistan (CDIP) programme is working to support the democratic processes by strengthening the capacity of the country’s political institutions to be more effective, accountable and responsive to the needs of Pakistani people. 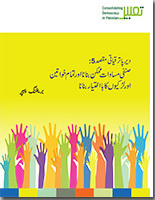 The Briefing Papers on Sustainable Development Goal 5: Achieve Gender Equality and Empower All Women and Girls has been prepared to provide background information to political party officials on Pakistan’s international commitments under Sustainable Development Goals (SDGs) and the state of gender equality in Pakistan. We hope that the paper will be useful for workers and officials of various political parties in Pakistan to fully comprehend SDG-5 and then oversee the efforts being made to achieve this goal.